When I return to Hawaii my first priority is to satisfy my food cravings from childhood memories. I eat like a 6 year old, because that is how old I was when I lived there so my memories aren’t of the most nutritious foods, but are Hawaiian foods that I love, and yes spam is top on my list. You don’t have to like everything, but I suggest you get out in the beautiful island of Oahu and at least try it all! In order to fully enjoy all this delicious food, we began every morning at Waikiki Resort Hotel, 1 block away from the famous Waikiki Beach and minutes away from highway H1 to take you all over the island. 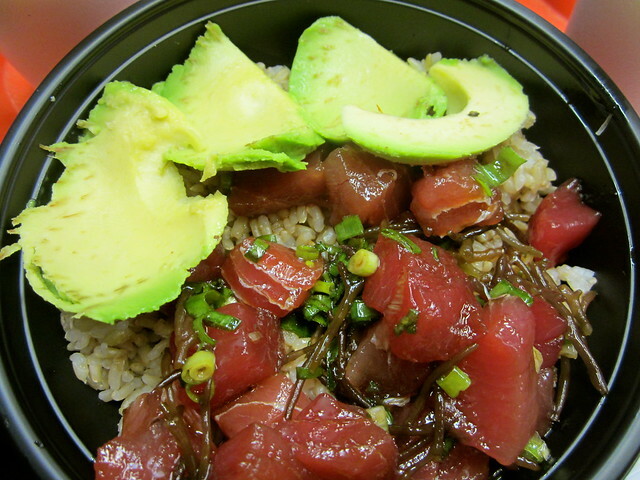 It was in what we considered one of the best locations in Waikiki surrounded by a mecca of food opportunities! Spam Musubi – A popular lunch or snack in Hawaii that has a slice of spam, a block of rice all wrapped together in seaweed goodness. Pineapple – Deliciously sweet and melt in your mouth good! On your way to the North Shore, stop by the Dole Plantation and taste out their Dole whip pineapple soft-serve. Chinese Rice Cakes – Sweet rice cakes with a gooey, spongey texture near impossible to describe. 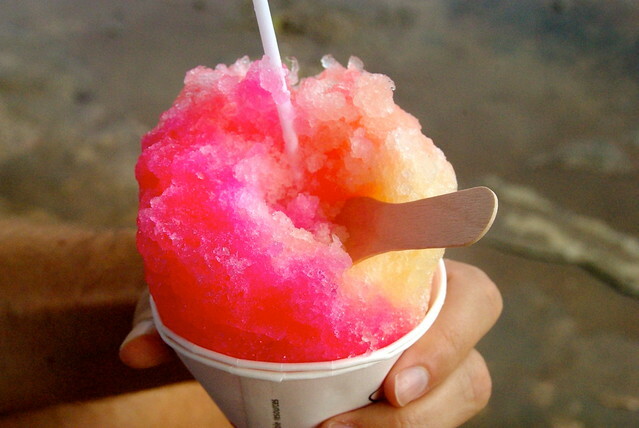 Shave Ice – My favorite is Matsumoto’s on the North Shore of Oahu. Shaving creates an insanely fine texture and the variety of delicious tropical syrups make this irresistible. 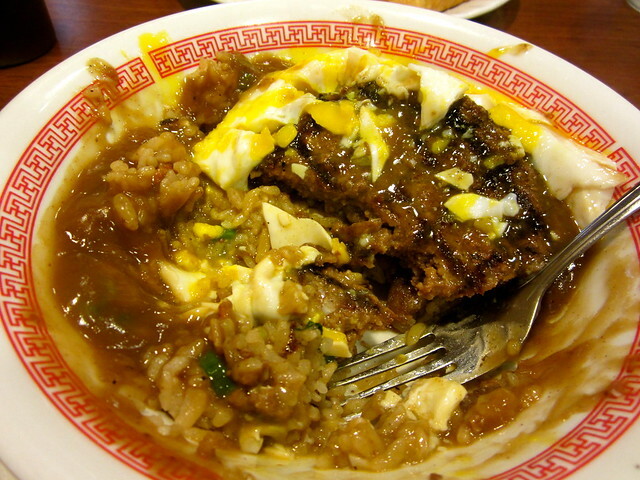 Loco Moco – A bed of rice topped with a large hamburger patty made from local meat, 2 runny eggs and brown gravy. This is a heavy meal, so come hungry or plan to share. Plate Lunch – The Hawaiian standard in including 2 scoops of white rice, 1 scoop of macaroni salad and a main entree like Kalua pork or Chicken Katsu. I recommend the Kalua pork. 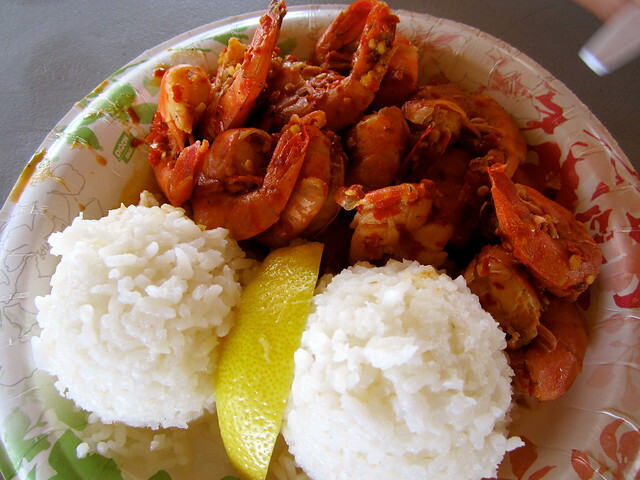 Giovanni’s Original White Shrimp Truck – If you are spending the day on the North Shore continue heading east past Sunset Beach and Turtle Bay Resort and eventually you will find Giovanni’s Shrimp Truck packed with visitors. We liked the hot and spicy! 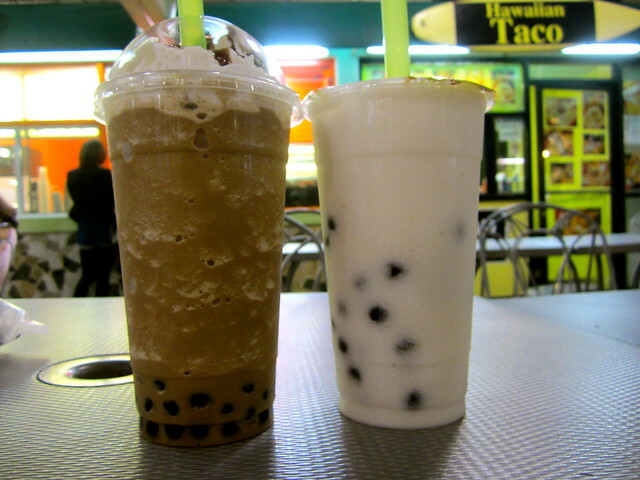 Bubble Tea – Fruit teas with large tapioca balls. This isn’t a Hawaiian drink but you can find lots of it at the International Market in Waikiki. Sounds weird but it’s delicious. Poke – Raw, cubed ahi marinated in sea salt and small amounts of soy sauce and seaweed. Can be served by itself or with rice. A must! Puka Dog/Hula Dog – 4 years ago it was Puka Dog, now renamed to Hula Dog, but still with the same toasted bread that wraps 365 degrees around your polish sausage. Yeah, that’s right. 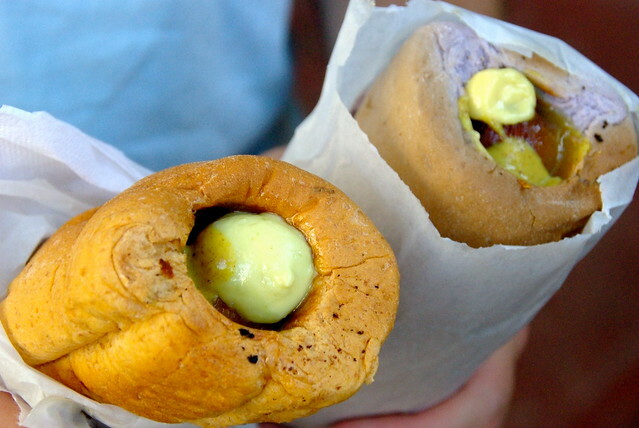 You get to choose from exotic mustard flavors like Lillikoi, your level of spiciness and we suggest always going with the bacon taro bread for the roll. 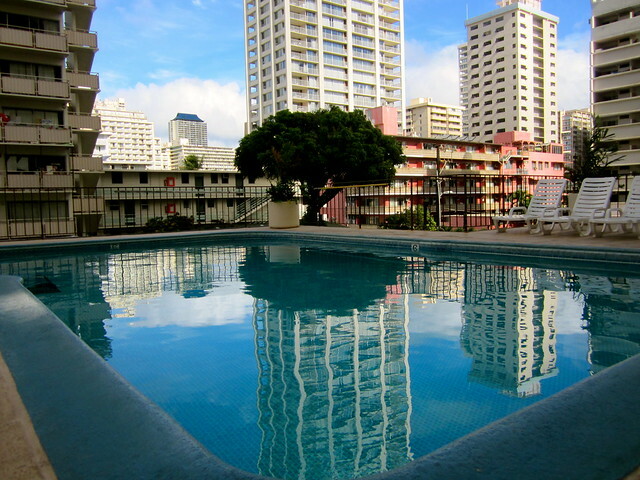 If you are traveling to Waikiki – stay in the city! Enjoy the perks that comes along with being able to walk to the beach and explore the markets and local restaurants on foot. To avoid an overly expensive hotel, sleep 1 or 2 blocks off the beach. 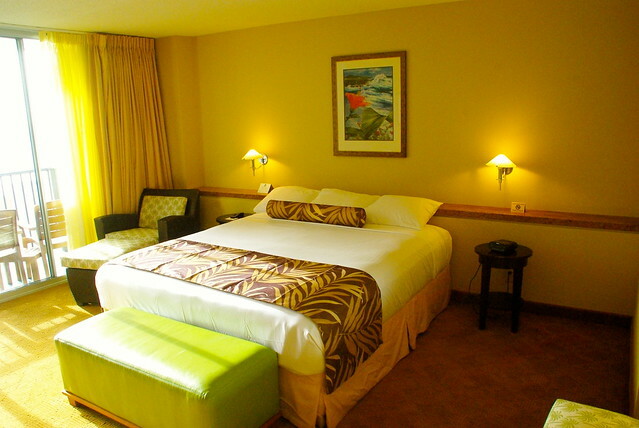 We stayed at Waikiki Resort Hotel which has beautiful rooms and an excellent location! 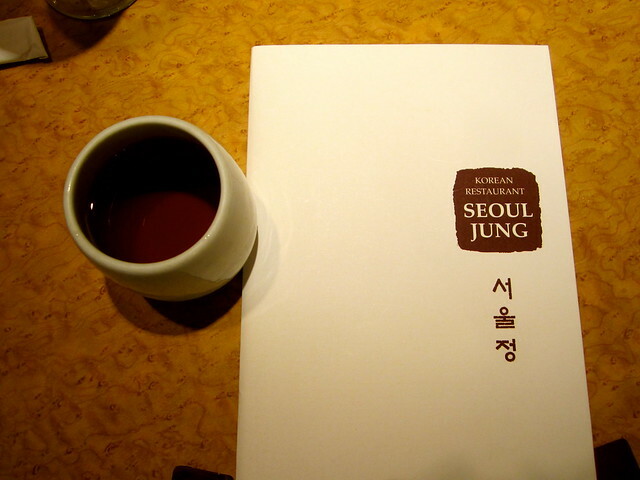 If you’re interested in trying some Korean food, try out their restaurant, Seoul Jung. We were impressed with their authentic menu and variety of flavors. The meats were unbelievably tender and it was by far the best meal we had while in Waikiki. After the long day we were so glad to return to a comfortable bed with our bellies stuffed, sitting out on our balcony with a glass of wine while we watched the sun set. My idea of a perfect evening! Book directly on the website, you can get their online package that includes breakfast at their restaurant Ilima. The WI-FI in the lobby is free. Book a corner room with a combined ocean and city view – both are beautiful! 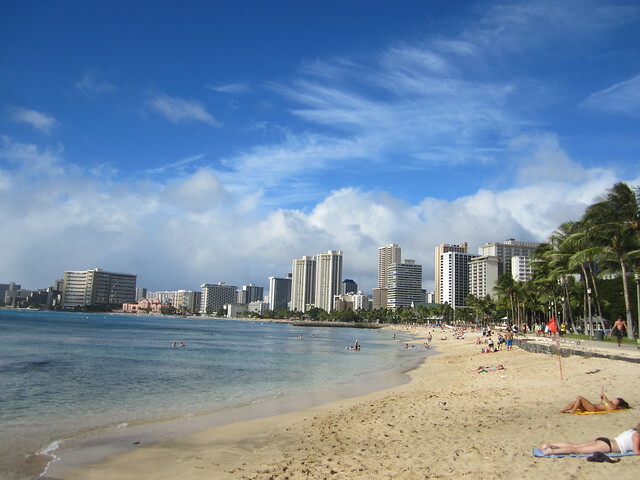 Many thanks to Waikiki Resort Hotel for partnering with us while we explored the Island of Oahu. I’m vegetarian so many of the items are off my list sadly! I like the look of moco loco though and bet I could find a vege version somewhere :). I’d like to try every single one of the foods you described. I REALLY need to go to Hawaii! I would have to nominate two of my favourite Hawaiian treats to make it on part two of the list. The first would be malasadas – those gorgeous, delcious, donut like things. I was at the Aloha swap meet when I saw a long line by an unmarked white van. I spontaneously got in line and was rewarded with incredible malasadas – covered in cinnamon sugar! The second is Hawaiian coffee. While Kona is better know as a coffee producer, there is amazing coffee from the north shore of Ohau at Island X at the Old Sugar Factory, Waialua. They are an amazing local, family run business and give great tours of their coffee and chocolate growing/processing efforts. Yes! I do love malsadas – good addition!! I’ll definitely add the Hawaiian coffee places to my list of places to try!